How Would Thomas Jefferson Classify Idaho’s Legislature? 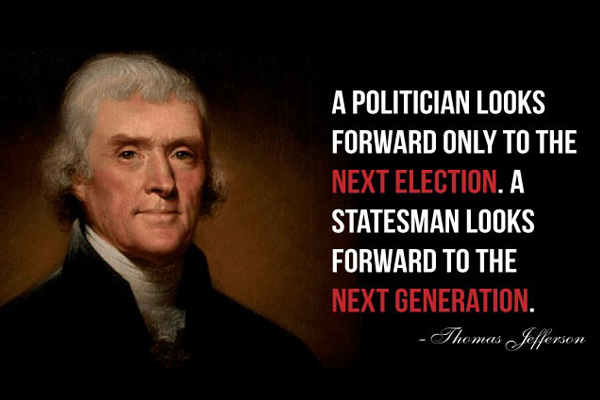 When it comes to the difference between Politicians and Statesmen, I tend to agree with President Jefferson. Although, to his definition of a Politician I would add: and is more concerned about winning favor or retaining power than maintaining principles. To his definition of Statesman, I would add: while exhibiting great wisdom and ability in directing the affairs of government. It would be safe to assume that most people getting into politics do so for the right reasons. They want to have a positive impact on their community or right some perceived wrongs. Many who get in for reasons like this remain pure in their intentions. They take their jobs as citizen legislators seriously and seek to do their best. I would consider these individuals to be Statesmen. But, there are others who seem to change as time goes on. There are many factors contributing to the journey from statesmen to politician. But there are three in major ones. One of the first things many new legislators realize is the difficulty of the process. There are rules governing almost every aspect of the job. These rules can be used as weapons and strike the uninitiated when least expected. To the newbie trying to get things done, finding a fast way to level the playing field can be enticing. The next thing coaxing an individual away from being a statesman is power. Power is a strong drug that is addicting. Politicians want to hold on to whatever power they have for as long as possible. This desire leads to taking ethical shortcuts and compromised principles. The final element contributing to an individual’s transformation into is fear. In today’s soundbite world, fear plays a major role in what is said and done. For example, a casual remark can create a social media firestorm. This social media threat tends to make individuals self-censor and choose safe positions. No one likes to be called out, especially in public. This threat is enough to make any individual concerned about getting re-elected be careful when choosing a position or casting a vote. Statesmen consider what happens if parents aren’t required to vaccinate their children. But a politician looks for the next soundbite opportunity and the number of likes on their last post. Statesmen don’t sign loyalty pledges to special interest groups. But, politicians look for ways to grandstand to attract special interest dollars. I need to take this opportunity to say how much we appreciate the Statesman that are representing us in Idaho’s, citizen legislator. We don’t tell them often enough that we are grateful for their steadfast attention to the principals that they were elected on. They are under tremendous pressure from grandstanding politicians who as a vocal minority think they are serving constituents. This minority is asking Legislators to sign a loyalty oath to The Republican platform. The same platform that has been drastically altered by the same people. One can’t argue the draw to convert from Statesman to Politician. Power, stature, and money all carry a strong appeal. But, Idaho needs more Statesmen than Politicians. Our legislature has spent too much time dealing with grandstanding instead of governing. Let’s help our legislators remain Statesmen not be politicians. Take a moment to send an email, text message or call your Senator or Representative today. I would like to thank my Legislators from LD 25 for always being Statesman. 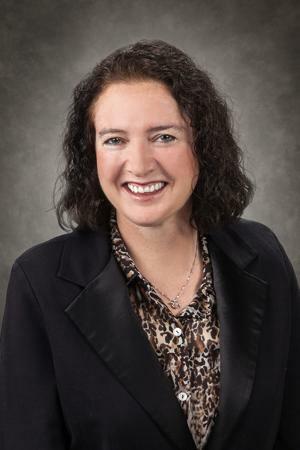 Gretchen Clelland is a financial advisor and former chairwoman of the Twin Falls County Republican Central Committee. She has served on the Idaho Citizen’s Commission for Reapportionment since its inception in 2014. Clelland also served as a delegate to the most recent Idaho GOP Convention.